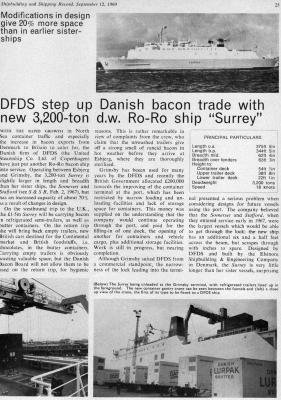 During the 1960s DFDS commissioned three remarkable little ro-ro ships specifically to handle the bacon trade from Denmark into the English port of Grimsby. The Somerset, Stafford and Surrey carried bacon and butter in refrigerated containers over to the UK before taking the “empties” back home again – (the crews complained of the strong smell of rancid bacon in the unwashed containers on the runs back to Esbjerg!). Designed to fit through the narrow lock at Grimsby port, the ships served into the 1980s (the last and largest, the Surrey, remained with DFDS until 1992). Thereafter, the ships have had interestingly varied careers, all three surviving into the new century before the ex-Surrey was scrapped in 2005. 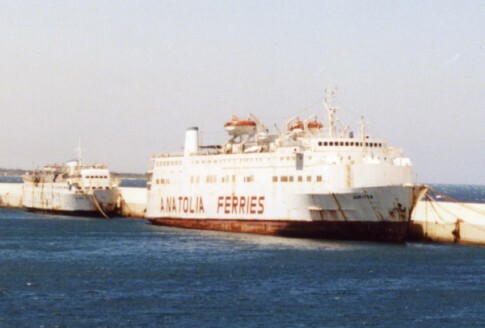 This vessel had in between times been converted to a passenger ferry by A K Ventouris, under whom, as the Anna V, she was mysteriously sunk by a bomb in Patras harbour. Repaired, she saw sparing further service as the Jupiter, being laid up for a prolonged period in Brindisi and then Elefsis before sailing for scrap as the Pit. 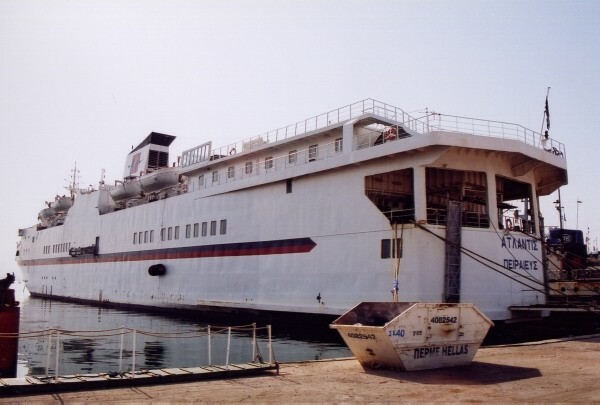 The Jupiter (ex-Surrey) laid up in Brindisi in July 2003 with the Tirana (ex-Linda Scarlett) astern. The Surrey’s earlier sister ships have both met slightly happier fates, although the future now looks uncertain in each case. The Somerset of 1966 became a livestock carrier but this picture from July last year shows her in a very poor condition. Her AIS is still on however and she is currently listed as sailing through Greek waters. On Ships Nostalgia (registration required) there is an astonishing picture of the ship, as the Afroditi, aground near Waterford in the 1980s with huge piles of hay on her after decks. The Atlantis laid up, July 2005. The Stafford (1967) was quite horrifically converted first into a Greek passenger/car ferry (named the Voyager and then the Monaco) and then into a cruise ship for operation out of Miami. She is seen here in her Voyager guise in the mid-1980s and, following her return to Greek waters, as the cruise ship Atlantis at Santorini in the early 2000s. Subsequently sold to American owners, the ship has been laid up for some time in Elefsis, latterly Elefsis Bay. 80 passengers lost their lives when the Express Samina sank in September 2000. The wreck still attracts interest however, as these images show. The Caledonian Steam Packet’s little motor ship the Maid of Argylle (1953) ultimately became the Greek City of Corfu and it was under this name that she caught fire and sank whilst alongside her namesake island in 1997. The wreck lay there for many years and was documented in these pictures from 2002. Here is a nice video documenting a crossing on board the Penelope A (ex-Horsa) in the Summer of 2008. Sticking with the website’s title ships, here is an unusual image of the Vortigern, near the end of her UK career, at Dieppe. Lastly the Hengist and perhaps her most famous moment, the grounding off the Warren in 1987, was captured on video. Meanwhile, the ship’s current operators, Ventouris Sea Lines, at last have a proper website, complete with a good selection of on board images of the most carefully maintained veteran ferry sailing in Greek waters. First up, Piraeus (and surrounding areas) in 1968. Some extracts from a 1970s film which highlights some of the quayside structures, including the long gone passenger walkways. In Piraeus port 1995, a cast of dozens of classic ships line up for the camera – this was before the demise of Ventouris Sea Lines later that year and the Apollo Express 2 is seen in operation, whilst the Milos Express (Vortigern) is seen just out of refit. At the end of the latter film comes footage of the Sappho (ex-Spero) and scenes aboard this ship feature heavily in these extracts from a 1970s film. It is readily apparent that her interiors were almost completely unchanged, right down to the large map of the North Sea adjacent to the information desk. Some more on board video can be found here (from about 3:25 in & turn the sound DOWN!). The Moby Vincent (ex-St Brendan/Stena Normandica) has recently received a big ‘duck tail’ extension aft. The Italian train ferry Cariddi was virtually a metaphor for the story of Italy’s railways in the Twentieth Century: constructed in 1932 she entered service between Messina and Villa San Giovanni as the most advanced ship of her type in the world. Diesel-electrical propulsion was employed and the ship reflected the huge amounts of money being poured into the railways and national communications under Mussolini’s fascist regime. The ship sank twice – the first time was during the Second World War when she was scuttled in Paradiso Bay, just north of Messina, the day before Sicily fell to the Allies in August 1943. She remained submerged for six and a half years before being raised, rebuilt and restored to service in 1953. Finally retired after a 59-year career, she was sold to the local authority in Messina and intended to become a maritime museum. 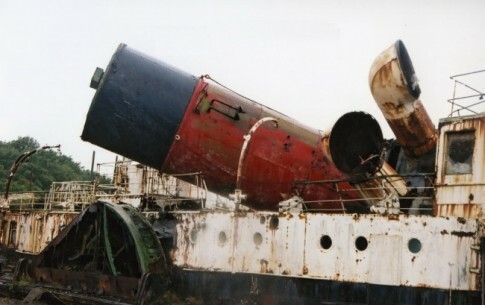 Neglected and abandoned, she sank for a second and final time in 2006. 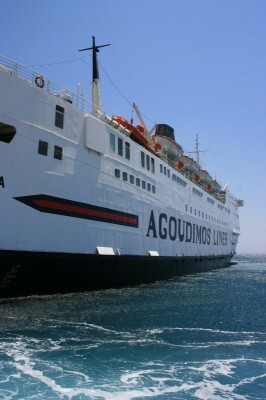 A more complete history of this route, one of the outstanding ferry experiences in Europe, can be found here. A similar fate, but with rather more tragic consequences, befell the Union Steam Ship Company of New Zealand’s Wahine which was lost within Wellington Harbour in April 1968. There is little one could like to know about this powerful-looking green-hulled ship and her demise that isn’t covered on Murray Robinson’s outstanding website. The website notes that the Wahine’s foremast has recently been placed in position as a monument on the rocks near to where survivors came ashore on the morning of the disaster. The Kalliste - in classic grey livery. Le Kalliste – tout blanc! Mystery still surrounds the future of the Ugo Foscolo (ex-Mikhail Sholokhov) which has been laid up in Zakynthos for over half a decade. 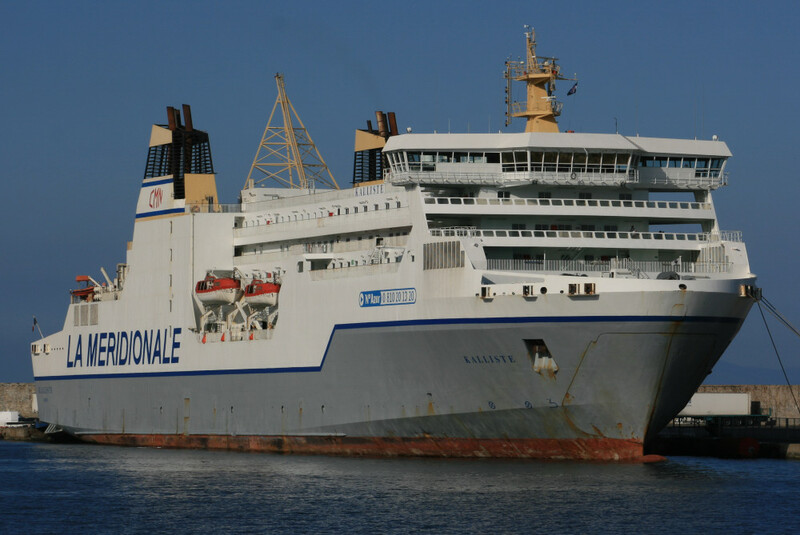 The local port authorities seem determined to remove her and one unlikely venture is this proposed conversion to a cruise ship involving Alexandros Panagopoulos, from the family behind Superfast and Royal Cruise Lines. ANEK’s Elyros has been a very popular addition to the Piraeus-Chania route since her entry into service in late 2008. KEH’s earlier rebuild proposal however called for an even more radical silhouette, including a Royal Caribbean-esque ‘Viking Crown’ lounge forward of the funnel. 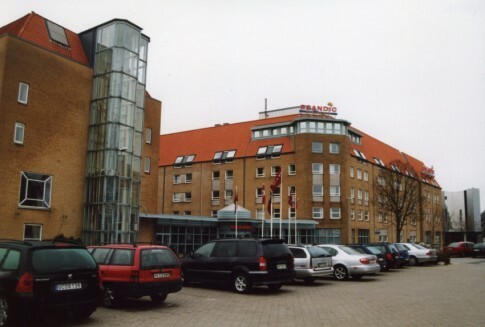 The Stena hotel in Frederikshavn, before its 'tropical adventure'. The previously fairly run of the mill Stena Line hotel in Frederikshavn is now The Reef Resort! As ever, Figura have been entrusted with the interior design work. A fascinating glimpse of the early days of cross-channel car ferrying can be seen in this remarkable series of slides posted to flickr, including a couple on board Townsend’s Forde just before the outbreak of war as well as others aboard the Maid of Kent and Twickenham Ferry. The link goes direct to those images tagged ‘ferry’, but the entire collection is worth a look. This is only marginally related to shipping but: The Sud Express is gone! OK, the name lives on, but the classic 1950s Wagons-Lits ‘UH’ class sleeping cars have been dispensed with and, with them, goes the final vestige of the last of the most famous trains of the Wagons-Lits, so many of which used to commence their journeys at Boulogne, Calais or Oostende in connection with generations of packet steamers. The Sud Express was established in 1887 and ran through to Lisbon from Paris and Calais (later it was just Paris to Lisbon and later still Paris to Hendaye/Irun, change trains, and then Hendaye to Lisbon). Alas, itâ€™s not just a case of â€œanother one bites the dustâ€ â€“ this truly was the last of the great loco-hauled Grand European Expresses. The Sud outlasted the remnants of the (real) Orient Express by a couple of years. The Nord Express, the Train Bleu, the Peninsular Express, the Oberland Express etc all fell by the wayside long ago. The relevance of these long-distance luxury train connections to the ferry industry died out decades ago with the onset of mass air travel, but the train/ship/train link was before then vital for anyone who wanted to travel significant distances in Europe. And just how useful would the Paris/Oostende-Oslo cars of the Nord Express (via the Nyborg-KorsÃ¸r and HelsingÃ¸r-Helsingborg train ferries) be today for ash-bound Continental shipowners wishing to get to the Shippax conference starting on the Color Magic on Tuesday…? Please send any contributions for ‘Things Seen’ to admin@hhvferry.com.